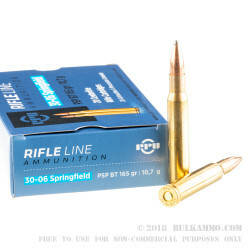 A welcome discount for high quality .30-06 ammunition that is capable of 1.5MOA in just about any gun, and capable of better accuracy give the right hardware and conditions. This Prvi Partizan .30-06 is a solid value for the money with the field ready soft point projectile in 165 grain weight and the Boxer primed brass which is easily reloaded. 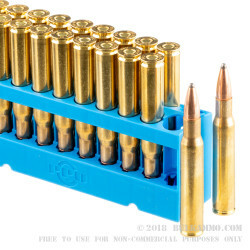 You’d be hard-pressed to find a deal better than this price on 500 rounds of .30-06 anywhere. The 165 grain pointed soft point is a very good hunting bullet with above average accuracy and above average deformation and bullet weight retention, even though it is not considered one of the highly engineered bullets currently available on the market. Sometimes old-school offerings make a lot of sense. In this case, this load can be used for hunting big game in most jurisdictions that still allow lead (check you state and local regulations before your hunting trip). 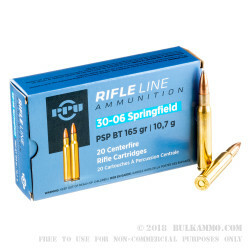 This 30-06 ammunition is factory new ammo that will easily function in a wide range of firearms including semi-automatic firearms and will achieve a high level of reliability time and again, with the accuracy you need to stay on target. 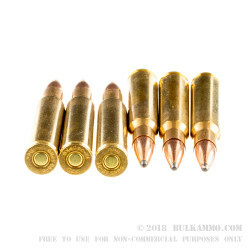 Yes there are more premium offerings available, but if you need a solid, workhorse round that is versatile enough to go from range to field easily; this is an excellent choice.